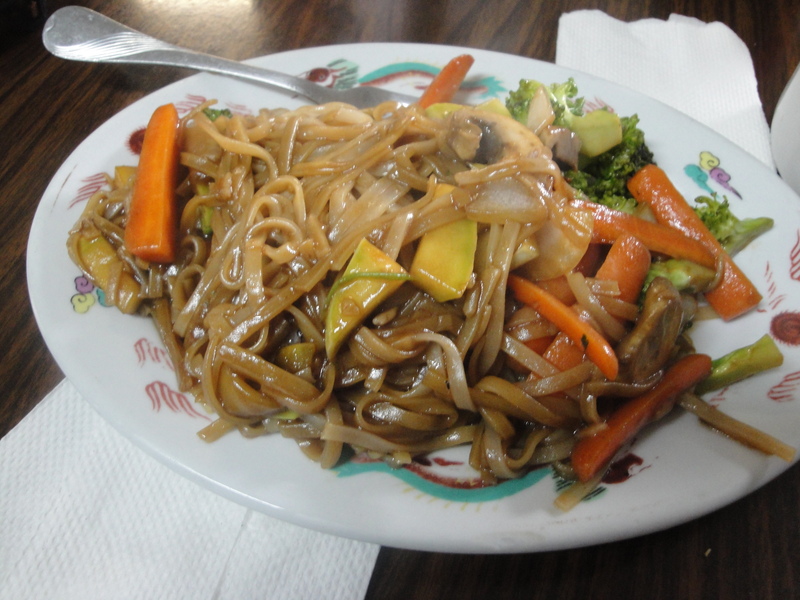 One of the places Vikki, the innkeeper at the Iron Mountain Inn, recommended for us to eat was Monsoon, a Thai restaurant about ten minutes away from the Iron Mountain Inn on Highway 67. 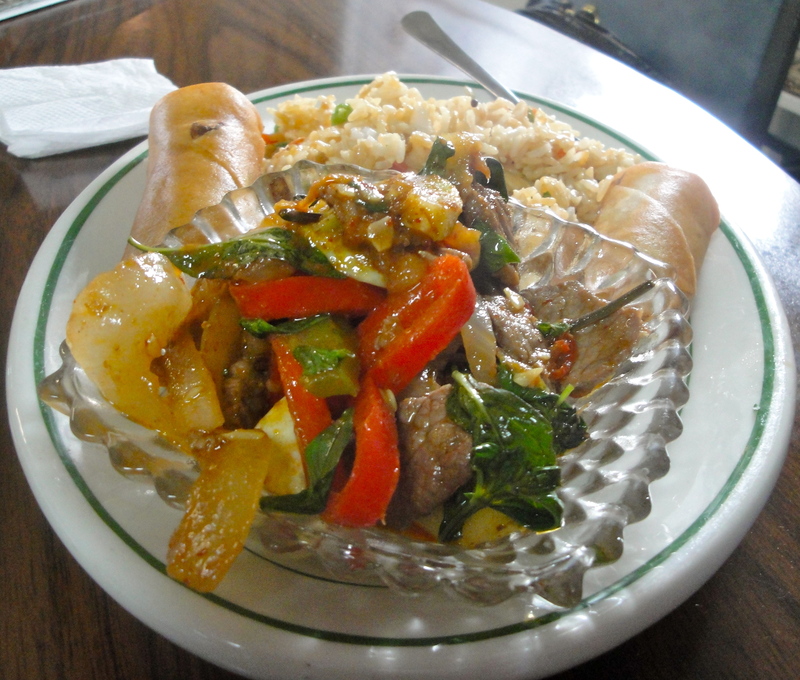 Butler, Tennessee, might not seem like the optimal place to find authentic Thai food, but we were pleasantly surprised. 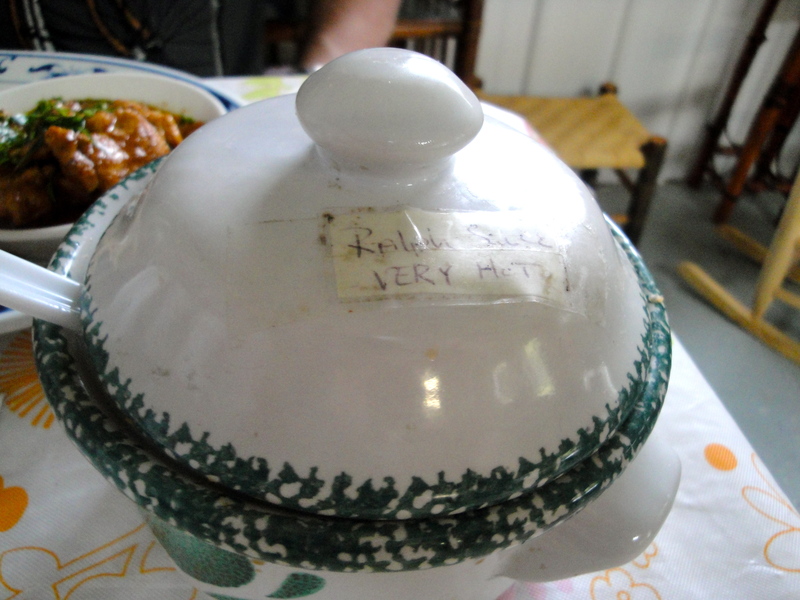 We had two great meals there and I am really pleased to be able to recommend the restaurant to you. The restaurant is recognizable by its purple sign. It used to have a much less flashy sign, but both it and the restaurant were damaged by the tornadoes that went through the area in April, and the owner took the opportunity to give herself a signage upgrade. The place is quite literally a shack, but don’t let that scare you. The inside is bare bones but homey and decorated with lots of photographs, trinkets, and paper lanterns. 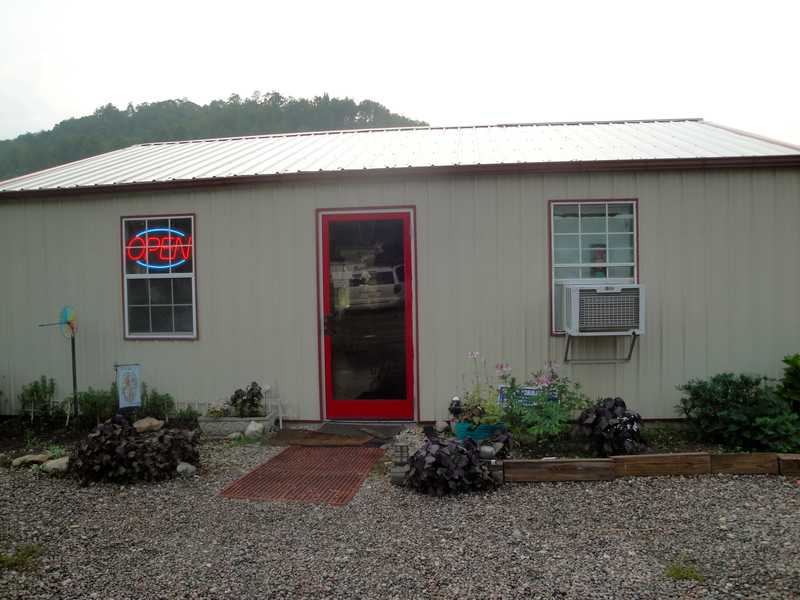 Out back is an herb garden where the owner grows thai basil, hot red peppers, and other ingredients for her dishes. We ended up going to the restaurant twice, for dinner on our first and our last night. The first night was a Thursday and there was only one other table present. We seated ourselves and were brought menus–with photographs for every dish–to browse. 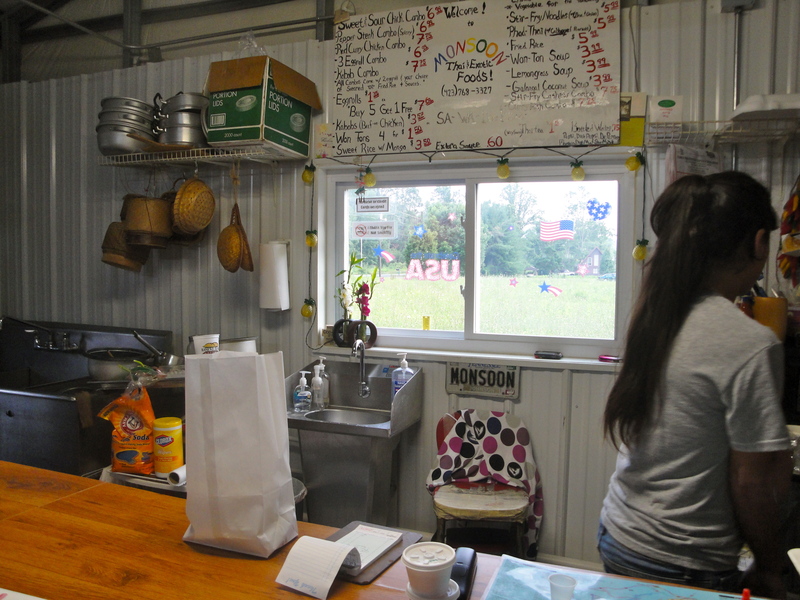 The kitchen is open and you can watch the owner, Mel, bustle about with her two daughters. There is also a large tv, which might be off-putting to some. I didn’t mind, mostly because they were playing The Travel Channel. While we were at the restaurant on our first night Mel played a recording of a local news feature that had been run on her restaurant. Her real name is not Mel–it is a nickname she acquired during her first job harvesting coconuts in Thailand. She shimmied up the coconut trees so gracefully that her coworkers named her Mel, which roughly translates to “cat.” Mel moved to America and ended up putting down roots in Northeastern Tennessee. 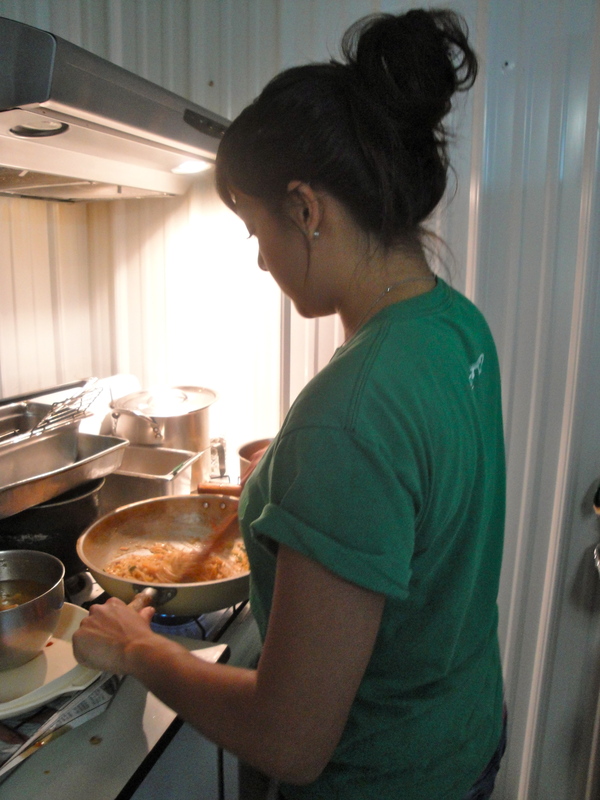 When she opened up her restaurant it was the first of its kind in the area–no one had even heard of Thai food. 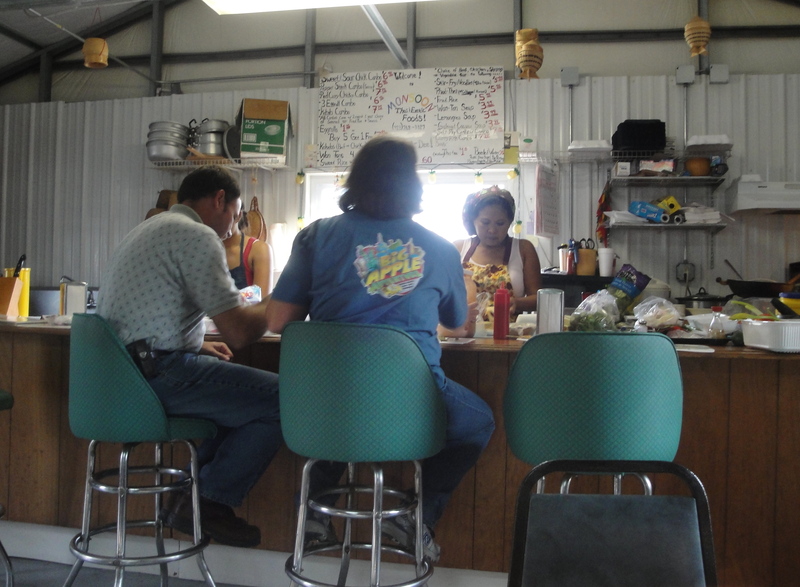 Now people come out to her restaurant from the surrounding cities and counties and she is something of a local legend. That’s Mel behind the counter. She is very sweet, very chatty. She spent much of her time on our first visit to the restaurant talking with the other table. 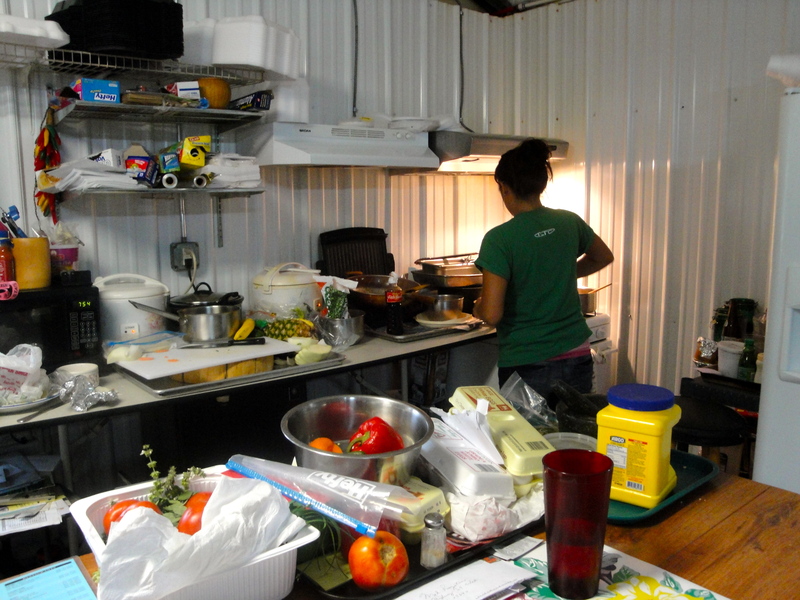 Our second visit was on a Saturday night, which was busier, so she was hard at work in the small kitchen. On our first night we ordered crab wontons, red curry with chicken, and pad thai. Everything was fresh and flavorful. 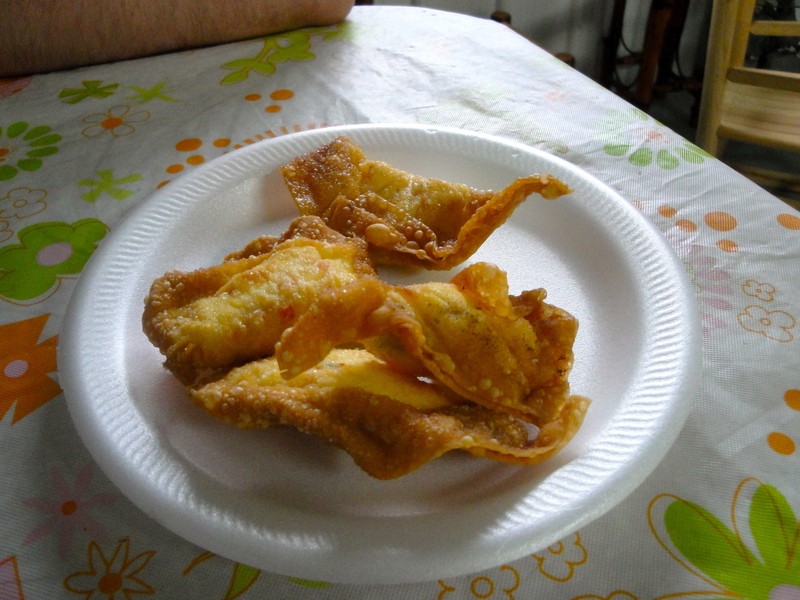 The wontons came straight from the fryer to our table. Jon ordered his red curry spicy and it was, but we asked for extra Ralph sauce (an extremely spicy sauce named after Mel’s pastor) to spice things up. 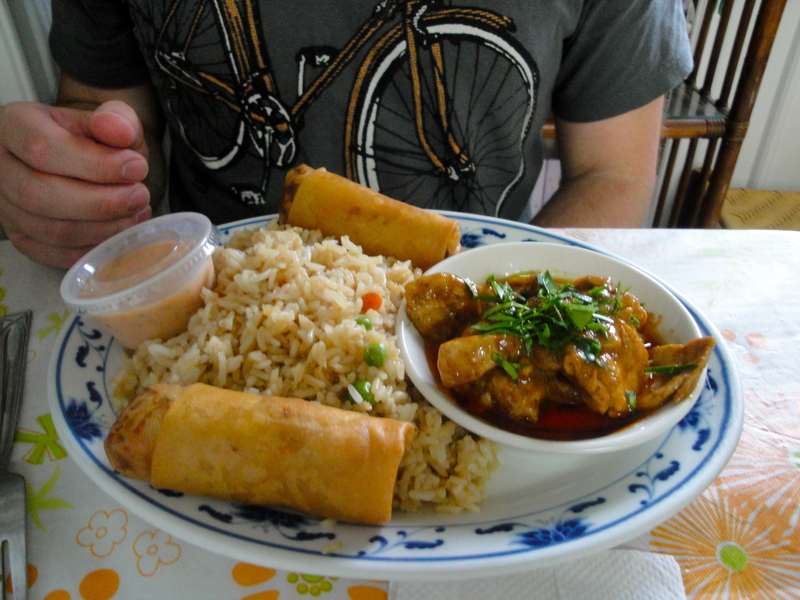 Jon’s dish came with fried rice and two delicious spring rolls. 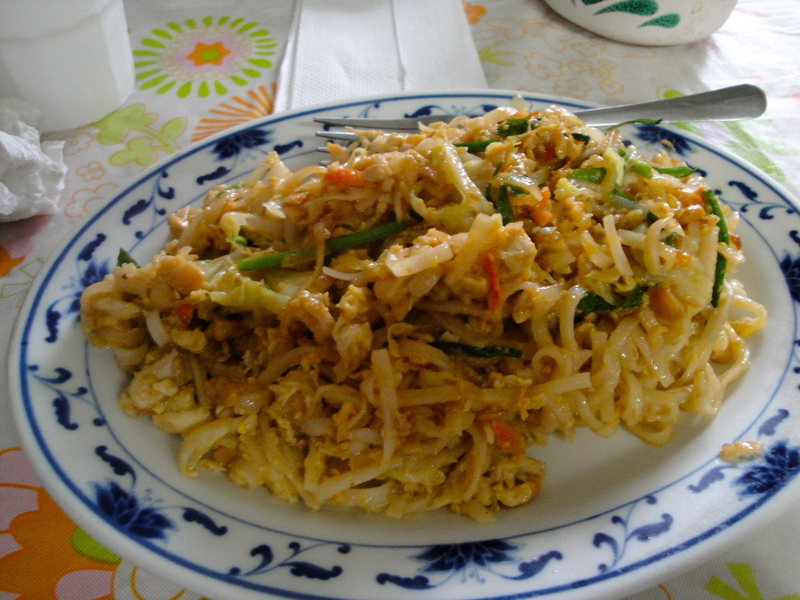 My pad thai was also very tasty, and not quite as heavy and greasy as a number of pad thais I have had in the past. On our second night at Monsoon Jon ordered a spicy pepper beef and I had stir-fried noodles with extra vegetables. Also tasty on both accounts. It is great to watch Mel or one of her daughters run out back to the herb garden to pluck some fresh herbs for the dishes. It doesn’t get any better than that! They also had an old-school mortar and pestel, which pleases the traditionalist in me. Vikki stopped in for dinner during our second visit to Monsoon. She was nice enough to pay for our dinner, which was a really pleasant surprise! Vikki sends many guests over to Monsoon; that is one of the charming parts about a community like this, everyone knows everyone else and everyone helps each other out. The menu had some tasty looking desserts such as sticky sweet rice with mango and fried bananas with ice cream, but we were so stuffed by both our dinners that we never got around to trying dessert. I guess we’ll just have to go back some day. 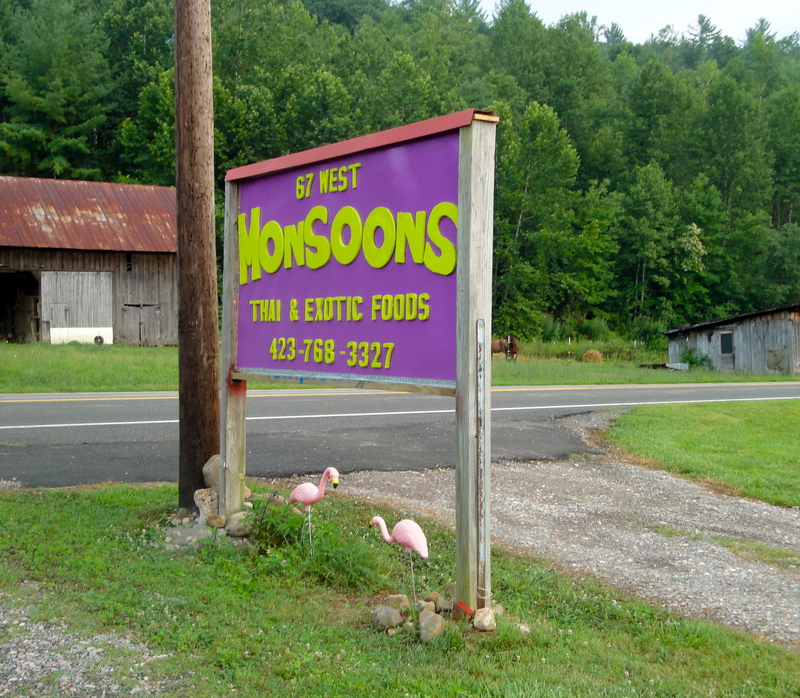 If you are ever in the Butler, Tennessee area and are looking for something really different then you should stop by Monsoon. It is something you would never expect to find in rural Tennessee!